Now that she's almost 8 months....I finally got around to posting this! Eats: pears, apples, sweet potatoes, brown rice, yogurt, oatmeal (homemade and boxed), avocados, bananas and she's still not sure about peas. Reaches for toys while sitting. Reaches up for Mom and Dad to be picked up. 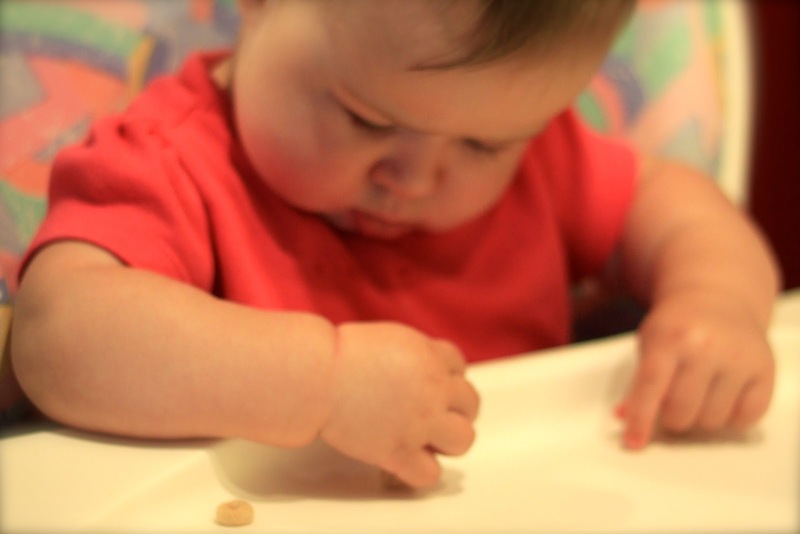 Incredible pincer skills and feeds herself puffs & Os. Recognizes meal routine & gets excited. Holds plastic bottles for most of her feeding. Turns to voices in any direction and almost knows her name. Getting pretty good at open mouth baby kisses, and almost on command. Spins around on belly to find a toy she wants. Rocks in the saucer, seated position, while someone carries her, and in push up position. Crawling here she comes! Talking to the baby in the mirror. We managed to squeeze one last month out of the bucket seat, but spoiler alert - we already swapped it out. Pediatrician recommended hands-on time has helped a bit with nap time. So has this Baby Einstein soother (oooo a remote in the shape of a sea shell!). 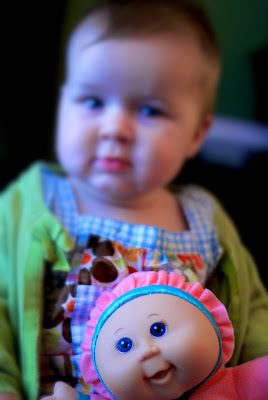 More mini-road trips this month, including a Mommy-Evie trip to the cabin to visit Nannie & Pap. Met my friend Dennis for the first time and was so shy and flirty in a way I've never seen before. And she's done it to him every time since. Must be the red hair. We have a half dozen bags of frozen breast milk left (y'all, you have no idea how happy I am to have my freezer back, yet so sad to see the milk go). Evie gets one every day or so...when we remember to defrost one. This month's routine: wake up around 7:30-8; small bottle & play; 9:30-10 nap with small bottle; wake up around noon for solids, small bottle and puffs, nap around 2 with small bottle, 5:00 wake up, puffs, solids, bottle, play with Daddy; 7:30 wind down (some nights a bath), books, prayers, bottle and bed by 8 or 8:30. Depending on how early she got up the naps might shift earlier and some days she'll squeeze in a short nap late in the afternoon. Now that we're pretty firm on the 8 or 8:30 bedtime (which she led), the wake up time is usually the same each morning. She's been waking up once a night, sometimes twice. One of those times we can usually let her cry herself back to sleep and the other time she's pretty hungry & wet. I totally quit pumping except once this month for relief. [TMI-] Sometimes I wake up with a really wet shirt. "Oh my God, she looks exactly like Eric, sorry, E"
Doing all sort of things with her, like trips, or leaving her with family, etc while we can before it becomes too complicated or another one comes along. Finding that the second we get comfortable in a new "routine" - Evie changes her mind and redefines it for us. Growing more in love for our sweet baby girl each and everyday! 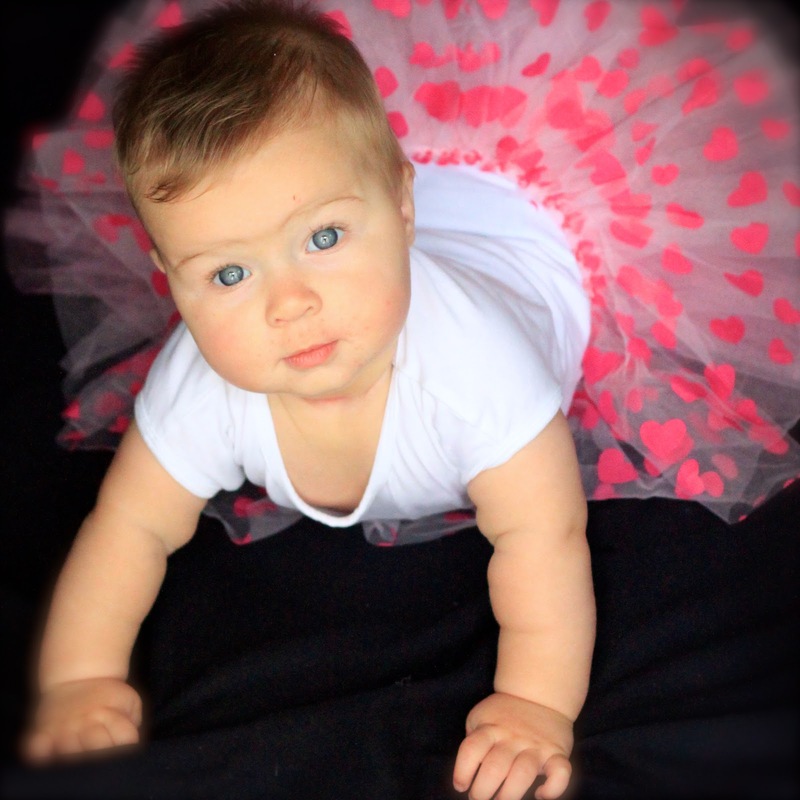 love that picture of her in the tutu! how cute!